Lunch for students at Lupaka Primary School in Zimbabwe. Exam pass rates used to be high at Lupaka Primary School in Zimbabwe, but then food shortages began and the children didn’t want to come to school any more. 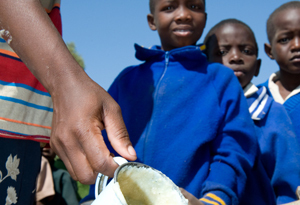 Caritas helped the students of Lupaka, providing daily meals of highly nutritious porridge to all 535 students. For many, it was the only meal they could count on each day. “When the food was introduced you saw mothers bringing their children to school and attendance greatly increased. Now, students are highly motivated,” said Ndlovu. Hunger has severe immediate and long-term consequences. Malnourished children are more exposed to disease and illness. Without an education, they will be in a vulnerable position for life. School meals provide critical nutrition, but also encourage children to stay in school.